Ford has revealed its new EcoSport compact SUV, which it promises will deliver enhanced versatility and capability, more refined styling, and sophisticated technologies from later this year. 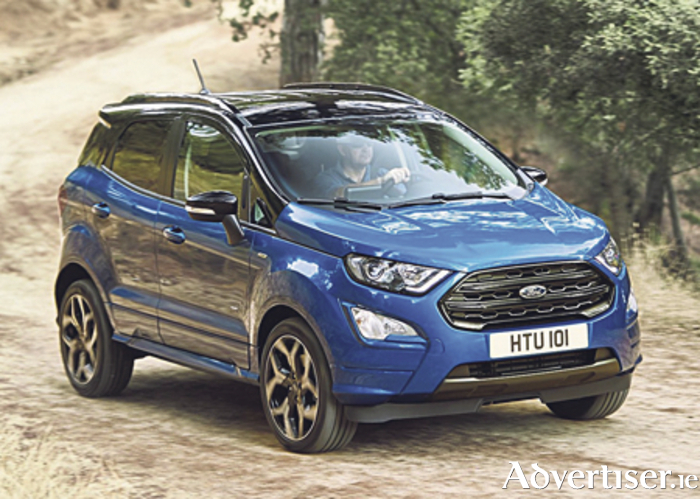 The new EcoSport for the first time offers Ford’s Intelligent All Wheel Drive technology for improved traction on- and off-road, combined with an advanced new 1.5-litre EcoBlue diesel engine, delivering up to 125PS and promised optimised CO2 emissions. It will also be available for the first time as a sporty, Ford Performance-inspired EcoSport ST Line model. The new Ford EcoSport delivers driver assistance technologies including ‘SYNC 3 Connectivity’, cruise control with adjustable speed limiter, and a rear view camera. Ford claims that it features enhanced dynamic, rugged and refined exterior styling, and the new model is being offered in 12 bold colours with even more personalisation options. Ford tells us that these will including contrasting painted roof colour options that extend to the window pillars, upper door frames, rear roof spoiler, and door mirrors. And it says that a user-centric, upscale new interior offers a superior occupant experience with floating central eight-inch touchscreen, heated steering wheel, and smart stowage solutions including an adjustable boot floor. “Ford has sold 150,000 EcoSport compact SUVs in Europe since we first introduced the model to the region in 2014, and last year sales grew 40 per cent,” said Steven Armstrong, group vice president and president, Europe Middle East and Africa, Ford Motor Company. The new Ford EcoSport for Europe will be built at Ford’s assembly plant in Romania, following a €200 million investment, and goes on sale later this year, joining the Ford Edge and Kuga SUV models. And a new SUV-inspired Fiesta Active crossover model also goes on sale in Europe next year. In addition to the new more capable EcoSport SUV, Ford also gave European public debuts of the more powerful new Ford Mustang sports car, and more premium Tourneo Custom people mover at the 2017 Frankfurt Motor Show. The new Mustang, EcoSport, and Tourneo Custom are joined by a new Ranger Black Edition pickup. It is limited to just 2,500 examples, and it was also on display for the first time in Frankfurt.